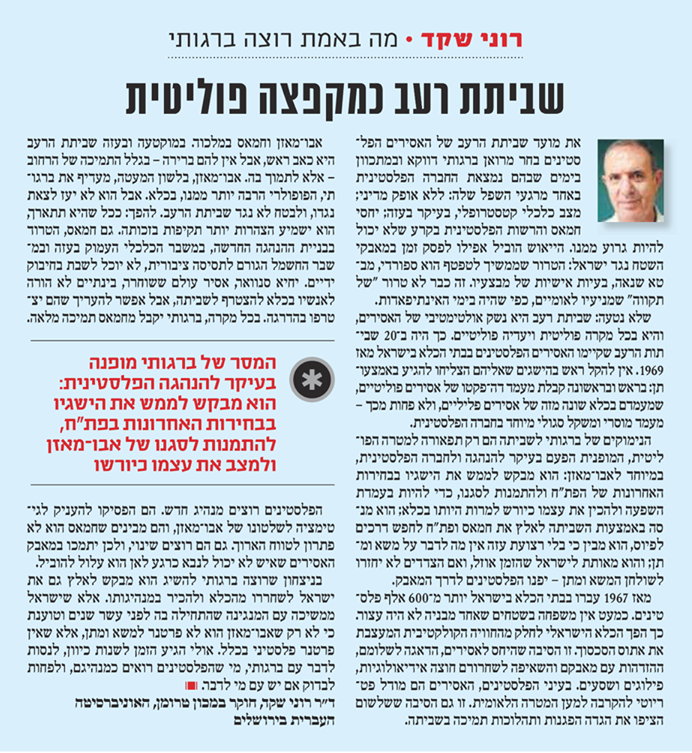 "חמור יותר מהמתח שהיה במלחמה הקרה"
Dr. Chen Bram , Research Fellow, published an article in the news paper Maariv about the one of the few countries in the world with a Muslim majority that maintains full diplomatic relations with Israel. Dr. Ronni Shaked, the Truman institutute middle east unit coordinator, published an article in the news paper Yedioth Ahronoth, about the failure to reach an agreement between Israel and Hamas, despite the outstanding interests of the parties. published on 06/08/18 at 'Yedioth Ahronoth'. Dr. Giora Eliraz, Associate Fellow at Truman Institute worte an article about The visiting in Israel of Yahya Staquf, the leader of the largest Islamic movement in Indonesia. "ד"ש חמה מסוריה לאוניברסיטה העברית"
"שיחת הסקייפ במכון טרומן עם האופוזיציה הסורית"
Yediot Aharonot wrote about Truman Institute unique Skype call at the Hebrew University with the leaders of the Syrian opposition. פגישת טראמפ-קים: "לא למהר לפתוח את השמפניות"
Prof. Nissim Otmazgin, Associate Director of the Truman Institute, talked about the North Korean's Interests in the talks between Trump and Kim. Dr. Giora Eliraz, Associate Fellow at Truman Institute worte an article about "family" suicide bombing in Indonesia, on the Forum's website for regional thinkung. Dr. Dikla Cohen, a Middle East researcher at the Truman Institute, talked about Who are the future candidates to replace Abu Mazen and what will happen in the West Bank on the day after? .Moran Levanoni, a research fellow at Truman, wrote about the culture of Lebanon. מפקדי משטרה ביישובים ערביים: "יש לנו כלים לכבות שריפות, אך לא לחולל שינוי"
Dr. Amira Halperin, a researcher at the institute, Published an article about the economic pressure on the Hamas organization, pressure exerted both by Israel and by the Palestinian Authority. published on 30/03/18 at 'Kol Israel'. Prof. Elie Podeh, a researcher at the institute, published an article about the meeting between Putin and Rohani and Erdogan in Ankara regarding the resolution of the conflict in Syria and the day after, only Syrian President Bashar Al-Assad was not present at the event. The first summit between the three leaders took place in November 2017 in Sochi, Russia. published on 05/04/18 at 'Ynet'. "ברפובליקה המוסלמית מבצעים ניקוי אורוות"
Dr. Zeev Levin, a researcher at the institute, Published an article about the cleaning of the stables, the significant reforms, led by the new ruler of the Muslim Republic, Uzbekistan, Shavkat Mirziyoyev, the successor of Islam Karimov who died in 2016.
published on 18/03/18 at 'Ynet'. Dr. Ronni Shaked, the Truman institutute middle east unit coordinator, published an article in the news paper Yedioth Ahronoth, about the political status of the Palestinians in the Teritories after Individuals Terrorist attacks. Shaked Talkes about the procceses that bring unsilence in the relationship between palastiniane and Jews in the Teritories. published on 18/03/18 at 'Yedioth Ahronoth'. "רוחות המלחמה בין מוסקבה לוושינגטון חוזרות לנשב בעוצמה"
Dr. Isabella Ginor, a researcher at the institute, took part in an article about the once again rising tension between the United States and Russia. The winds of War between the great nations, comes back to blowing hard. published on 18/03/2018 at 'Globes'. "מלחמת ברית המועצות נגד ישראל: גילויים היסטוריים ולקחים אקטואליים"
Mr. Gideon Remez and Dr. Isabella Ginor, researchers of the institute, published the text of their lecture about "The war of the USSR against Israel: historic revelations and actual lessons", which deals with the recent years developments, when Post-Soviet Russia backs to straightforward and aggressive military intervention in the Middle East. published on 15/03/2018 at 'Yakum Tarbut'. "הפרופסוריות שלוקחות את מצב הנשים באקדמיה בידיים"
In honor of international women's day, an article has published that deals with women in academia. The women researchers forum tells about the status of women in the academia. published on 08/03/2018 at 'Mako'. "הסכסוך בדרום הפיליפינים: עימות בין-דתי מתמשך"
Dr. Giora Eliraz, a researcher at the truman institute, published an article at The Forum for Regional Thinking, about the conflict in the Southern Philippines, a confrontation between radicle Islamist terror organizations, and the Philippines president Rodrigo Duterte. published on 28/02/2018 at 'The Forum for Regional Thinking'. "?אסלאם רדיקלי באינדונזיה: האם הערבים אשמים"
Dr. Giora Eliraz, a researcher at the truman institute, published an article at The Forum for Regional Thinking, about the rise of radical Islam in Indonesia, the fear of the Indonesian authorities of "Arabization" of local islamic organizations. published on 05/01/2018 at 'The Forum for Regional Thinking'. Dr. Ronni Shaked, the Truman institutute middle east unit coordinator, published an article in the news paper Yedioth Ahronoth, about the political status of the Palestinians, after Trump's declaration about Jerusalem. published on 25/12/2017 at 'Yedioth Ahronoth'. 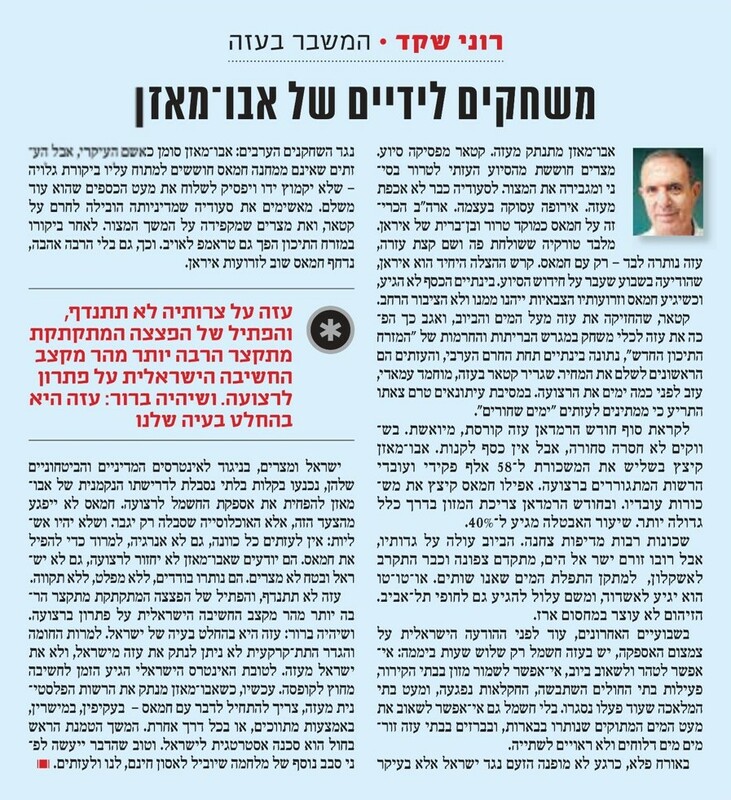 Dr. Dan Orbach, a researcher at the Truman Institute, published an article in the "Kol Hashavua" magazine, about the situation in North Korea and if it might be a coup in the country? published on 08/12/2017 at 'Kol Hashavua'. "לחקור את יפן: מסע לארץ השמש העולה"
Prof. Nissim Otmazgin, Associate Director of the Truman Institute, research the Japanese culture distribution in East Asia. "I've been studting for six challeging years at Kyoto University, the ancient emperor capitol of Japan. Unfurtunately i didn't became a Samurai, but i did finished with a Ph.D.". published on 25/11/2017 at 'Ynet'. "מלכוד 22 של השמאל באמריקה הלטינית"
Dr. Mauricio Dimant, the Latin America Unit Coordinator at the Truman Institute, and Dr. Assaf Ashkenazi, in an articale about the challenges of the left wing in Latin America to be an alternative to the struggle against poverty and inequality without intimidating voters from the prospect of a return to dictatorship? Published on 21/08/2017 at 'Ynet'. "מתחת לגלימה האדומה: הנזירים שמסיתים לרצח עם"
Dr. Chen Bram, research fellows at the Middle East Research Unit, in an article about the ongoing attacks against the Muslim minority in Myanmar, encouraged by none other than the Buddhist monks in the monasteries. Published on 12/08/2017 at 'Ynet'. "עוד נתגעגע לאבו מאזן - לקראת קרב הירושה"
Dr. Ronni Shaked, the Islam and Middle East Research Unit Coordinator at the Truman Institute, in his latest articale about Mahmoud Abbas. Dr. Ronni Shaked, the Islam and Middle East Research Unit Coordinator at the Truman Institute, in an article about the latest events concerning Temple Mount. "צום בכפייה? הפולמוס סביב הרמדאן בתוניסיה"
Dr. Daniel Zisenwine, a researcher of the institute's Africa Unit, in an article about the public debate in Tunisia over the complex tension between state and religion regarding Ramadan fasting in the newly refounded democratic country. "משחקים לידיים של אבו מאזן"
Dr. Ronni Shaked, the Islam and Middle East Research Unit Coordinator at the Truman Institute, in an article about the electricity power crisis in the Gaza Strip, following the diplomatic changes in the region. "כשישראל הפילה מיגים רוסים והסובייטים שקלו לתקוף בגרעין"
Dr. Isabella Ginor and Mr. Gideon Remez, research fellows at the Middle East Research Unit, in an article presenting their new book findings about the USSR's millitary intervention in the conflict between Israel and Egypt during the years 1967-1973. Dr. Isabella Ginor and Mr. Gideon Remez, research fellows at the Middle East Research Unit, in an article presenting their books research findings about the USSR's millitary intervention in the conflict between Israel and the Arab nations during the years 1967-1973, and the implications of the Cold War on the millitary and political relations in the region. Dr. Ronni Shaked, our Islamic and Middle Eastern Research Unit Coordinator, in an article about the Palestinians prisoners hunger strike and it's impications on Israel, the Palestinians and the peace process.